Open Market residents are up in arms. Is anyone listening? 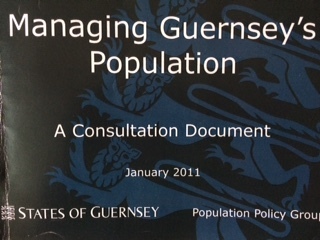 It took more than six years for the States to turn its unfortunately-named 2011 consultation on managing Guernsey’s population into the full-blown 2017 Population Management Law. In the year since it was enacted, flaws have become evident and arguments about it have remained heated. To appreciate why this delicate subject came up at all, you have to appreciate how the island’s original arrangements for controlling the housing market came to ruffle feathers in the local community. Those arrangements had an elegant simplicity. The bulk of the island’s housing was “Local Market” and protected for locals. The “Open Market,” which was established in a stroke of genius in the post-War 1940s, was for “incomers”. Alas, what is simple rarely stays so. Itinerant workers needed for the agro-growing and hospitality industries were allowed over the years to live indefinitely in the island on a “nine months on, three months off” basis. Likewise, skilled people needed in the expanding offshore finance sector were allowed to live in the more expensive part of the Local Market under Housing Licences lasting five to ten years and in some circumstances 15 years. By the early 2000s the number of “incomers” in the Local Market had grown and, to the dismay of many locals, they could appeal under freshly-embraced human rights provisions to stay on longer than envisaged. The 2017 legislation introduced a new system of work permits which could control numbers directly rather than through housing controls. The permits became easier to secure, but itinerant workers now felt unwelcome because they could not stay beyond five years and, perhaps alarmed by the coincident Brexit decision, simply started leaving. This soon forced an awkward reversion to the convenient “nine months, three months” provisions. In the Open Market, post-legislation developments have been hotter. To understand this, it should be said that the Open Market is possibly one of the most inspired creations the island has ever produced. At its peak some 1,700 residences were marked out for anyone wishing to buy them, and outsiders were duly attracted by the friendly tax regime and the very Britishness of the island’s security and stability. These arrivals posed no threat as they comprised a tiny minority of the total population. They benefited from a complete lack of restriction and were permitted to work if they wished. Locals not only enjoyed a protected local housing market, they could also reap the knock-on economic benefits brought by the usually wealthy incomers. Unfortunately, these so-called “Part A” houses became a contentious issue where there was unplanned multi-occupancy by unrelated individuals, blurring the boundaries with the so-called “Part D” sector relating to lodging houses. Essentially, enterprising residents within both the Local and the Open Market saw opportunities in the economy’s continued growth to bypass the licencing regime or simply to make a profit by investing in “Part A” and “Part D” properties to house staff and workers on a multiple occupancy basis. As individual homes became more like lodging houses, the States didn’t tackle the problem at root by challenging the offenders or reinforcing existing regulations. Instead these homes became a significant target of the population management review. In the opinion of many Open Market residents now suffering from a prolonged period of market weakness, this review was also the trigger which started the decline in “Part A” values. True or not, the resulting work permit laws which were enacted in 2017 and which redesignated multi-occupied “Part A” properties as “Part D” have proved painful for those investing in multiple occupancy dwellings. This is because visiting workers calculated that it made better sense to live on a more freely-available work permit at a lower rent in a Local Market house than to stay in a lodging house at a higher rent in the Open Market. The overall result of these trends is that an overlap has occurred between the top end of the Local Market and the lower end of the Open Market, where previously the Open Market was typically valued at a significant premium. Unsurprisingly, leading Open Market residents have formed a group called the Open Market Forum to register their concerns. Their immediate complaint is that the legislation has eroded their rights, and that they were never consulted over the tightened restrictions. This is disputed by the government, but feeling is running high and it would not be surprising if the matter went to court. This would be a pity. Down the years the Open Market has managed without support from the States, it has required minimum administration and posed a low cost to the public purse in terms of policing, education and social services. At the same time it has contributed substantially to the retail, construction, gardening, travel and restaurant trades, to the professions and finance sector, and notably to charitable causes. The persistent problem, however, is that even now not everyone thinks the Open Market is wonderful. States deputies openly acknowledge that the basis of the old regime, namely the preservation of Local Market housing, has changed. The objective now is management of the size and make-up of the population. They dislike the idea of more people coming to a supposedly crowded island, potentially compounding a growing demographic burden. And they feel Guernsey should not compete for footloose wealthy people who may not spend much time in the jurisdiction, let alone settle in it. The harsh reality, however, is that other jurisdictions are doing exactly that: certain Caribbean countries, places like Portugal and Malta, even Australia and New Zealand – although in New Zealand’s case these have tightened recently. The UK itself has until recently made highly visible and successful efforts to attract wealthy individuals. These counterpoints are a reminder that the task for the Forum is not only to make a business case for government spending on promotion of the Open Market, but perhaps also for the Open Market itself. It is likely to be prove a long and drawn-out battle without more vocal support from the wider population and, especially, from government representatives. The economic benefit arguments for retaining the Open Market remain compelling. But this successful phenomenon, which has brought so much win-win benefit to the island, is plainly a fragile thing. You interfere with it at your peril – and right now it is in a bit of a state. –The island’s population management review settled on no firm figure for the future size of the island’s population, although numbers like 70,000 were bandied about. The existing population figure is just under 63,000, not much more than it was ten years ago. –Open Market house values have been on their back for several years. The market has seen no perceptible benefit from any emigration of “non-doms” in the UK seeking to escape the UK government’s escalating attacks on their privileges, nor from the uncertain implications of Brexit.